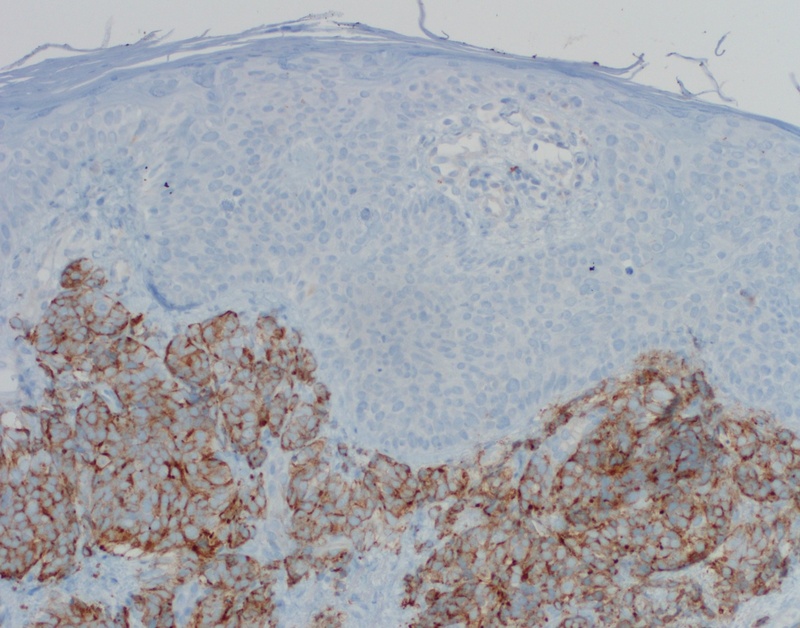 Thanks to Dr. Jerad Gardner, University of Arkansas for Medical Sciences, for contributing this case. To contribute a Case of the Week, follow the guidelines on our Case of the Week page. (1) In February 2014, we again had record traffic, with a daily average of 18,323 visits, surpassing the prior record of 17,502 visits per day in October 2013. Thanks for your support, and we welcome your suggestions on how to make PathologyOutlines.com even more useful to the Pathology community. 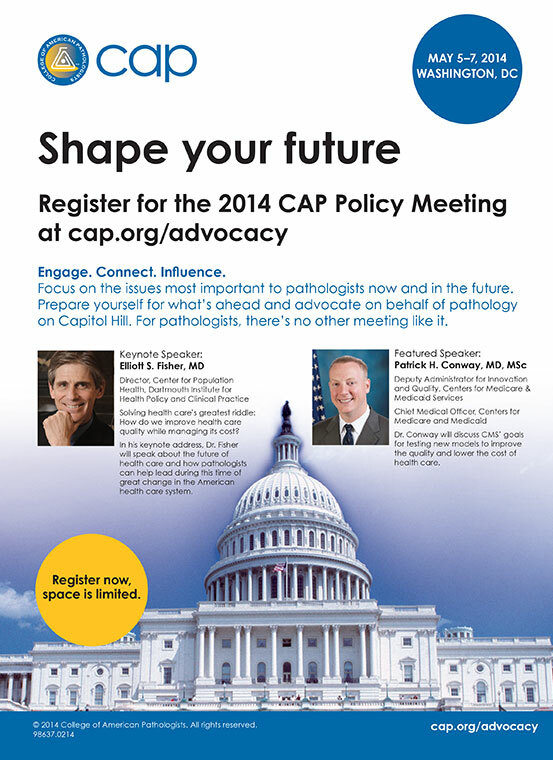 (2) We received comments at USCAP '14 about the links to Nature images not working. Nature is blocking our links because "we are driving too much traffic to their websites". You can view the images using one of two workarounds. Either (a) refresh the window, which sometimes works, or (b) copy and paste the image web address into a new window or tab and press Enter. You can try with this link: http://www.nature.com/modpathol/journal/v18/n12/fig_tab/3800483f3.html#figure-title. (3) Nephropath contributed numerous images, posted to these topics in the Kidney-nontumor chapter: amyloidosis, diabetic glomerulosclerosis, focal and segmental glomerulosclerosis, IgA nephropathy, light chain deposition disease, membranoproliferative glomerulonephritis, membranous glomerulonephritis, minimal change glomerulopathy, myeloma, post-infectious glomerulonephritis, rapidly progressive (crescentic) glomerulonephritis, SLE / systemic lupus erythematosis, thin glomerular basement membrane disease / lesion, tubular disease - general. Also, thank you to the following image contributors: Junaid Baqai, MD (Lung nontumor - Coccidioides immitis), Wafaey Fahmy Badawy Mohamed, MD (Thyroid - Follicular carcinoma), Angel Fernandez-Flores, MD, PhD (Skin Nonmelanocytic tumor - Sebaceous hyperplasia), Marino Leon, MD (Nasal cavity - Nonkeratinizing nasopharyngeal carcinoma - undifferentiated) and Semir Vranic, MD (Bone - Ewing sarcoma). 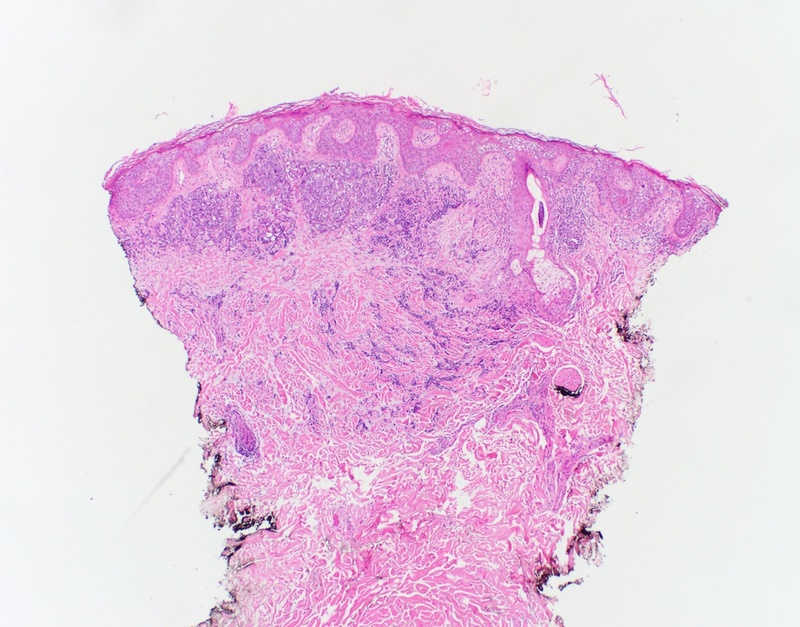 A 55 year old woman presented with a skin nodule on the chest. 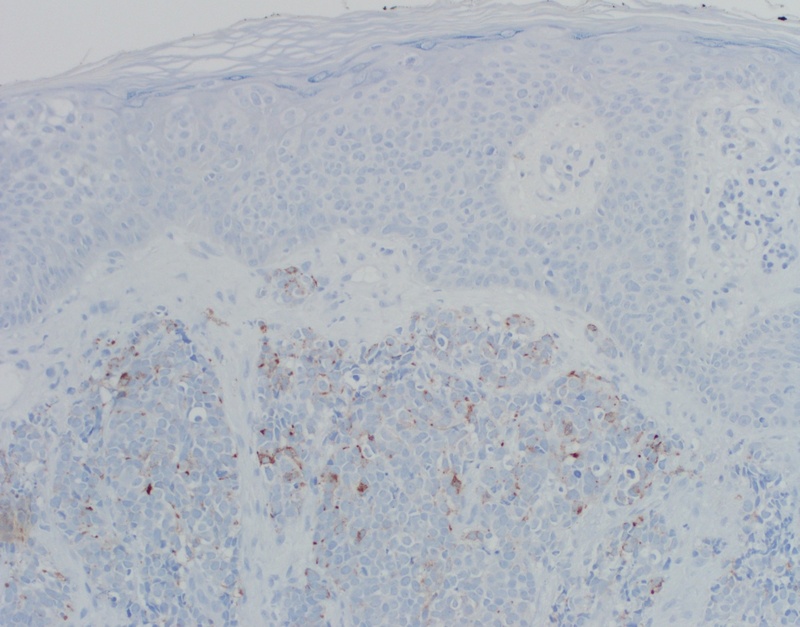 This is a nice example of a collision between two known entities, in-situ squamous cell carcinoma / Bowen's disease and dermal Merkel cell carcinoma. 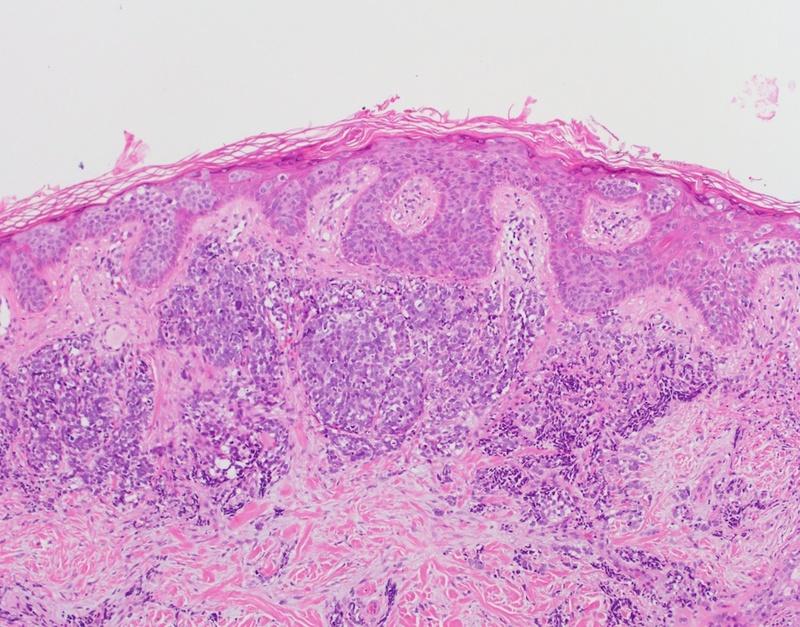 Squamous cell carcinoma is common, and derives from keratinocytes in the epidermal layer, often due to sun (UV light) exposure. 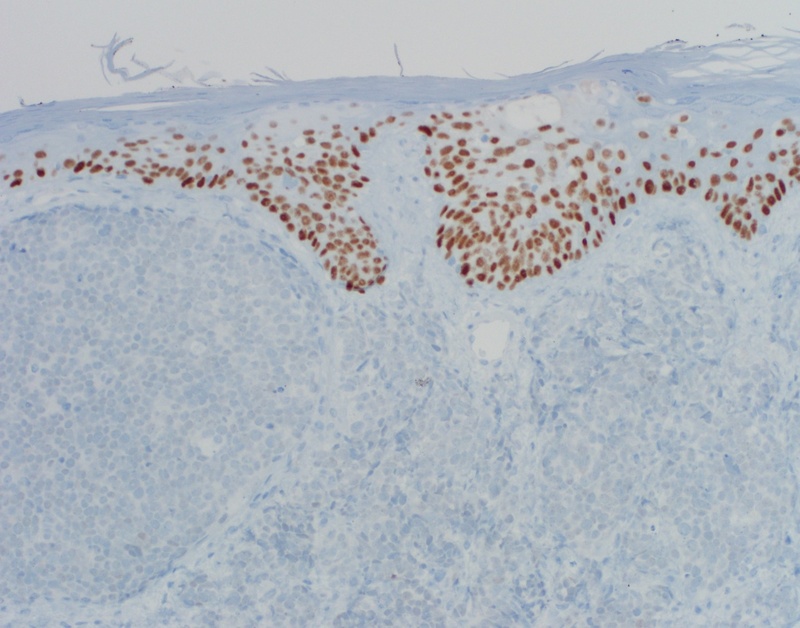 Merkel cell carcinoma appears to derive from Merkel cells, which are specialized skin cells important for proper neural encoding of light touch stimuli. They have recently been shown to arise from skin lineage, not neural crest (Dev Biol 2009;336:76). 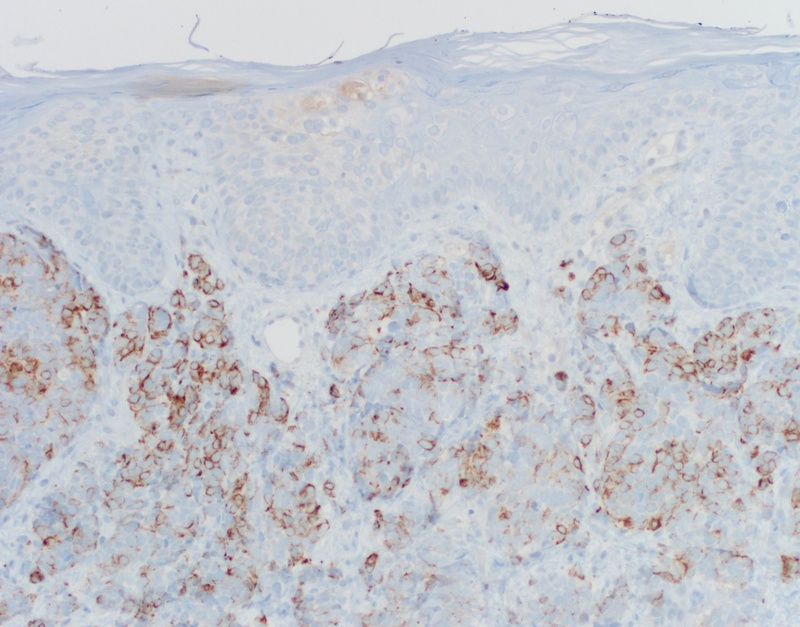 Merkel cell carcinoma is an aggressive cutaneous neuroendocrine tumor with a rising incidence (Curr Dermatol Rep 2014;3:46). 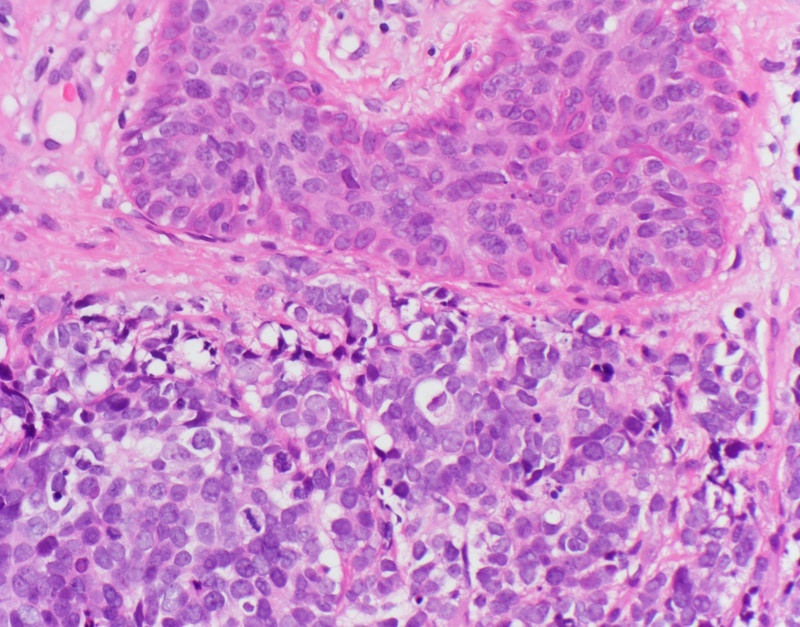 Histologically, it is dermal or subcutaneous centered with monotonous round tumor cells with a scant eosinophilic cytoplasmic rim, round and vesicular nuclei with finely granular and dusty chromatin and multiple nucleoli. There is frequent apoptosis and mitotic figures. 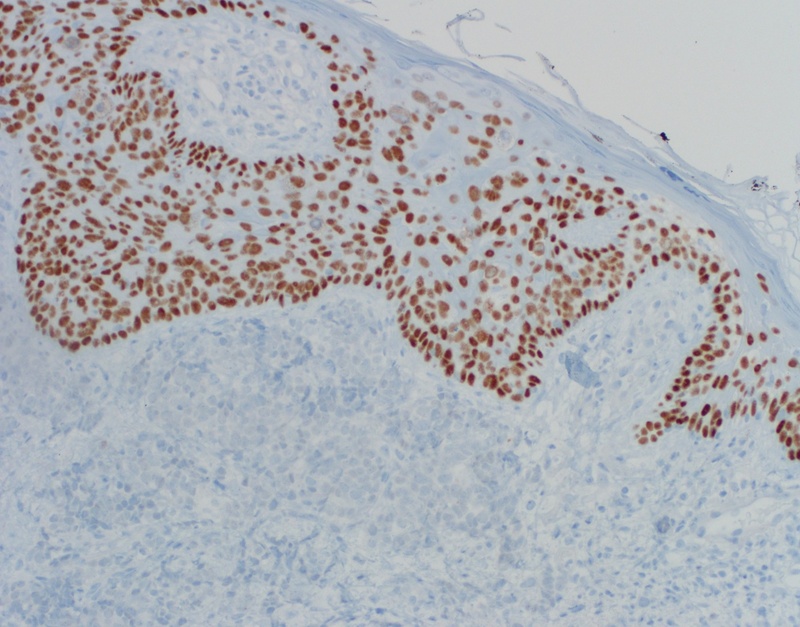 The stroma may be vascular, with plump epithelial cells. 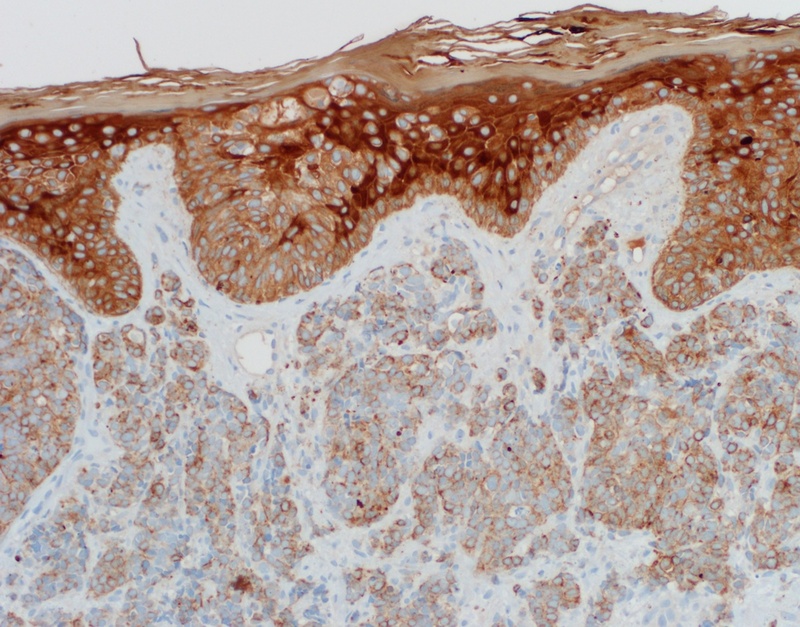 Merkel cell carcinoma has a 5 year survival of only 46%, and has metastatic potential regardless of the size of the primary tumor. To date, there is no effective treatment for recurrent or metastatic disease, although detection of polyoma virus in these tumors (Science 2008;319:1096). suggests that alternatives to chemoradiotherapy may be more effective.